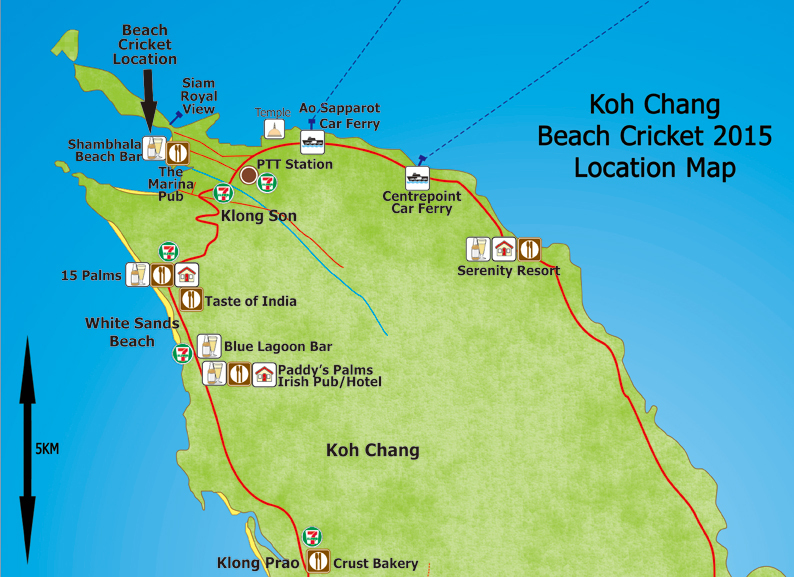 The Koh Chang Beach Cricket Tournament takes place at Shambhala Bar at Siam Royal View in Klong Son Bay. When you are arrive on Koh Chang by ferry turn right and drive over the hill past the Chinese Temple on the right hand side. This is 500 metres from the Ao Sapparot Ferry and 3km from the Centerpoint Ferry. Then carry on another 500 metres up and over the next small hill and then turn right directly opposite the PTT petrol station on the left side. Follow that road down for 1.5km past the Siam Royal View gatehouse and then the Yacht Marina and you will reach the beach and Shambhala Bar – you’re there!